Feeling somewhat settled, I set about firming up the plan for remotely advising my research group in Cambridge. As with every August, there have been a few departures and arrivals, and I carefully typed in the email addresses for my entire group. There are eight of us: myself, a staff scientist, a Hubble fellow, two postdoctoral fellows, and three 4th-year graduate students. But what struck me was this was the first year my research group had reached gender parity: Four women, and four men. Schemas are non-conscious hypotheses. They are expectations or stereotypes that influence our judgments of others (regardless of our own group). For example, with regard to gender, we’re not just talking about men judging women; we’re also talking about women judging women. Men and women both downplay the contributions of women. With regard to race/ethnicity, we’re not just talking about whites judging minorities; we’re also talking about minorities judging minorities. Whites and minorities both downplay the contributions of minorities.Unconscious bias is NOT discrimination. Here’s an example of a schema from Wikipedia: A well-dressed businessman draws a knife on a vagrant. Onlookers may (and often do) "remember" the vagrant pulling the knife. Today's guest blogger is Nicholas McConnell. Nicholas is the Beatrice Watson Parrent Fellow at the Institute for Astronomy (University of Hawai'i). His research focuses on supermassive black holes and giant elliptical galaxies. A couple of years ago, in the midst of applying for postdoc jobs, I scanned a particular department's directory page for people who shared my research interests. As I scrolled through the names and photographs, two things quickly became apparent: there were very few women, and almost all the men looked somber or dour. Unfortunately, this department was hardly alone in exhibiting a gender imbalance among its researchers. The male mugshots left a stronger impression: "This does not seem like an enjoyable place to work." The presence or absence of a smile often serves as a basic reading of a person's emotions or demeanor. However, psychology experiments have long shown that only a fraction of smiles are genuine "Duchenne" smiles: involuntary muscle actions at the eyes as well as the mouth. The rest are voluntary situational devices, used to ease tension, convey compliance, or appear attractive. In contrast, refusing to smile can telegraph high status, and in men even correlates with testosterone levels . Many women have described facing social or professional pressure to present a smiling face, which is insidious when it reflects a double standard for people with equal status . In a review of numerous studies, Yale professor Marianne LaFrance and collaborators found that women smile more often than men on average, and in tense or embarrassing situations. The gender difference is enhanced when individuals know they are being observed, suggesting that communal gender norms do influence facial expressions. However, it diminishes for individuals with the same power level, or in the same professional or social role . Today's guest post is by Debra Fischer, a Professor of Astronomy and head of the exoplanets group at Yale University. We’ve all been witnessing the embarrassing charges of sexual harassment by San Diego mayor, Bob Filner. As the number of women coming forward continued to increase, it seemed surprising that this could have gone on for so long. However, the women subjected to his predatory behavior were generally subordinates or emotionally compromised; they were not on equal footing with this man. They may not have even realized that this was a pattern of misconduct rather than a particular, and perhaps flattering interest in them. Bob Filner’s behavior was egregious and should have been easy to recognize – yet it was years before he was exposed. Fortunately, sexual predators are rare. The problem is that these individuals can also be difficult to recognize. The offenders can be charismatic and may well have high social IQ’s, even though their behavior is actually manipulative and sociopathic. They hide in plain sight in either large or small departments because their behavior is not directed toward their peers – it is directed toward those who would find it difficult to come forth or who might lack credibility. Students, postdoctoral fellows and junior faculty can all be vulnerable targets if inappropriate attentions come from someone who is in power. The conundrum is that networking is a critically important part of carrying out the business of science. The vast majority of leaders in our field are activists who try to seek out and encourage new talent and this recognition of your talent is an affirmation that you are an emerging scientist and a valued colleague. However, if the attention begins to feel too flattering or if you are the target of inappropriate behavior, it is in your best interest to find the ear of someone you trust. If multiple allegations of misconduct begin to pile up, departments should see this as a red flag for behavior that is detrimental to a vibrant academic climate. The 2010 report entitled, Why So Few? Women in Science, Technology, Engineering, and Mathematics, by the American Association of University Women (AAUW) is based on interviews with top researchers and a review of the large body of academic research literature on gender and science. It presents eight separate research findings on the nurture side of the nature-nurture debate. 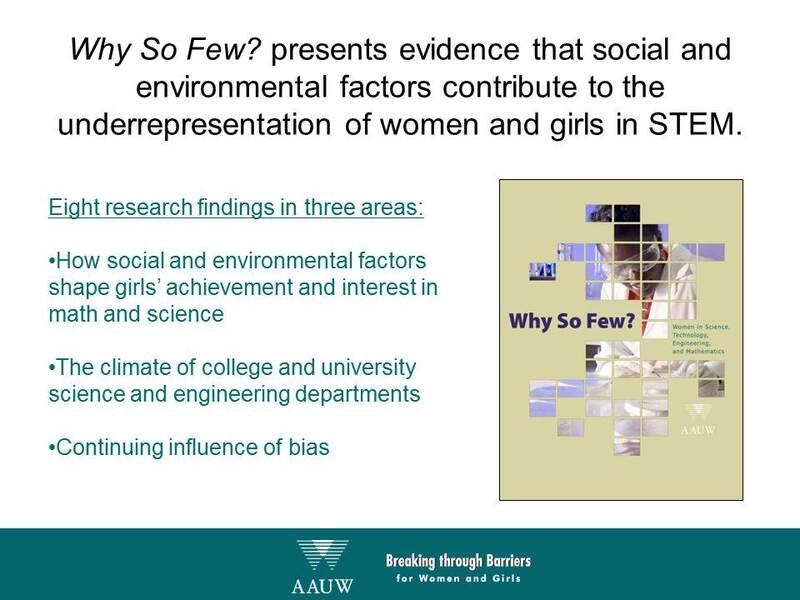 Each of these findings demonstrates that social and environmental factors clearly contribute to the underrepresentation of women in science and engineering. 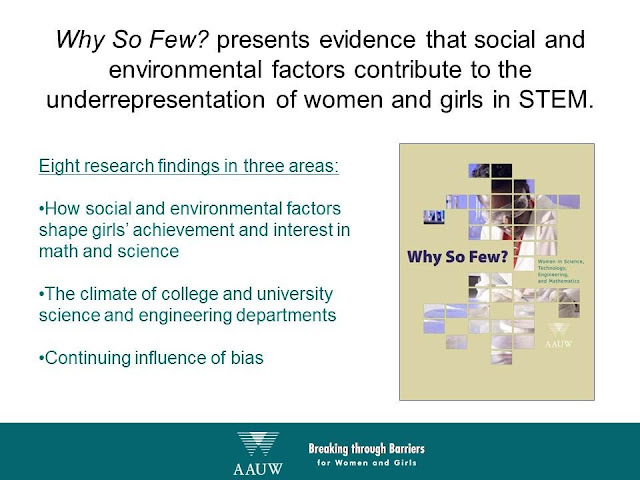 The research findings are organized into three areas: (1) how social and environmental factors shape girls’ achievements and interest in math and science; (2) how the climate of university science and engineering departments affect women’s - both students and faculty - experience in STEM fields; and (3) the continuing role of bias in limiting women’s success in STEM in education and the workplace. My husband and I have been actively trying to conceive for over a year and a half and working with a fertility specialist for over a year. We’re both postdocs in STEM. I’m in astronomy. As a postdoc, I know I’m not alone in feeling a lack of control over ‘the next step’ in my career. Having another important piece of my life feeling as though it’s outside of my control has at times been too much. It’s particularly hard at the beginning of each new cycle. I’m a naturally optimistic person, and so each month I get excited about the possibility, and then when it doesn’t happen, I’m still learning how to cope with the loss. I’m extremely grateful for the flexibility that comes with being a postdoc. Because of this, I’ve been able to arrive late or leave early for the multiple appointments each month (1x during the first week of the cycle, 1-3x mid cycle, and 1-2x at the end of the cycle). I’ve also been thankful that I can choose whether to travel or not for research. Although I love to travel, we saw early on that, even if I don’t feel stressed while traveling, it has a significant impact on the length of my cycle, when I ovulate, etc. But I do worry about the impact this has had on my research and forward progress in this career. I’m still finding the right balance, for me, of how much emotional and mental energy to give to our fertility quest. We know we’ll be parents, whether through treatment or through adoption, so sometimes I am able to legitimately take a longer timescale view of the process and gain comfort in that. But other times it’s just really hard. 4. Why Aren't More Girls Attracted To Physics? When traveling to a completely new city, or especially to a different country, knowing how to do basic things like getting around via public transit and knowing where to eat can become difficult tasks. However, with the right person by your side, the difficulty in handling these activities melts away and the adventure becomes much more enjoyable. In this case the “right person” is someone who lives in the particular place, or has been there before. It takes very little effort for a French person to help the uninitiated travel around Paris and find a good place to have lunch and a latte. However, this small effort has a big effect on the newbie. Similar arrangements can be set up along the well-trodden road of academe. For a first-year grad student, the journey ahead can seem daunting. Knowing what classes to take and which to put off till later; how to interpret Prof. X’s lack of eye contact; how to set up a new computer account; how to approach and pass the qualification exam. All of these tasks can be very challenging and frustrating for a young scientist. However, for an Nth-year student, a postdoc or professor, these tasks are very manageable if not completely trivial. The older person can act as a guide, or mentor, with a very small investment of time and effort, knowing that the investment can have a huge payoff for the mentee. CSWA got great advice on negotiating for a tenure-track position from Mordecai-Mark Mac Low. Mordecai is a tenured research curator in the Dept. of Astrophysics of the American Museum of Natural History in his home town of New York City, a position he got only after working in every time zone of the continental US, and Germany. He studies the formation of planets, stars, and galaxies, mostly using numerical simulations. I just assisted my partner in her negotiations on beginning a tenure-track position in another technical field, so let me see if I can recap some of the thoughts I shared with her. Don't take it personally when sudden delays appear in the offer and appointment process. Administrators get distracted, have piles of paper on their desks, and don't always sign off as quickly as they should. During my own appointment, the Provost in charge left on a research expedition for two months between initial offer and final agreement, during which absolutely nothing happened! Start paying attention to the internal politics during your interview, and identify your allies. They may be able to feed you valuable inside information during the negotiation to make sure that you neither leave money on the table, nor make an unrealistically large request that is dead on arrival. Usually there is a factor of two or so range within which you can operate. I recently heard this story on NPR about why some schools have a higher percentage of girls taking physics than others (the story was also posted on the CSWA facebook page. The study done by Dr. Catherine Riegle-Crumb sought to understand why there is such a wide variation in the number of girls taking high school physics across the country. After controlling for factors such as wealth, family educational background, and location, She says that: "What we found is that in communities that had a higher percentage of women in the labor force who are working in science, technology, engineering and math, that in those schools, girls were as likely as boys to take physics, or even more likely." Commentator Shankar Vedantam followed up, saying "what causes this effect? You know, high school girls don't hang out at the local tech company to see whether there are women working there or not. And she said it's subtler than that. You know, having more women in the local tech workforce changes local norms. It changes how the playing field tilts. You know, who do you see on television? You meet the mom of a friend at a birthday party and it turns out she's an astrophysicist." And while I don't think Vedantam was intentionally particularly singling out women astronomers, I can't help thinking of myself as being that mom. Vedantam referred to this as a chicken-and-egg problem, because "Fewer girls may be taking courses that lead to tech careers when they don't see female role models already in tech careers." Being a role model matters. What happens at one point along the the leaky pipeline affects other points of the pipeline. That is, fixing a leak for early- to mid- career level women can fix leaks further upstream. Just being a woman in STEM in your community makes a difference. This is important for those of us who sometimes feel overburdened by the pressure to do public outreach, precisely because we understand the impact of having role models. You don't necessarily have to do formal public outreach. By being the friend's mom, the parent's co-worker, or the next-door neighbor, we make a difference. This week I gave a talk about physics education that included a substantial discussion of the benefits of diversity in creating a successful university program. I was presenting in a different country, where the culture is patriarchal although respectful of minorities. Very few of the faculty or students in this physics audience were women. At the end of the talk, a young man asked, "Why are you trying to recruit women? Isn't that reverse discrimination?" I smiled, glad to have an elephant in the room revealed. Fortunately, I had been thinking about his question for a while, as it has come up in other settings. I answered no, I didn't consider it reverse discrimination, it was merely rectifying an imbalance caused by discouragement and implicit bias. He then asserted that perhaps women didn't want to pursue science careers and were making other choices. I replied that the women I had spoken with definitely wanted to pursue science careers, and I concluded that no, I was definitely not practicing reverse discrimination. It was a short exchange, I resisted the temptation to launch into a wider discussion about cultural stereotypes, bias, etc. (Know one's audience -- that approach would likely have been ineffective in this country.) This kind of question can be frustrating, but it also represents an excellent opportunity to present facts and to show the many benefits of improving the climate in our departments and workplaces. We will never change the hearts and minds of everyone, but there are young men in such audiences who may become allies, and young women who will appreciate the encouragement. At the very least, speaking out sets a good example for department leadership to do likewise. It's also a good thing for men to be speaking on this issue, as it makes the charge of reverse discrimination less plausible to other men. Today’s suggestion comes from CSWA alum, Caroline Simpson. Caroline is an associate professor at Florida International University. She works on star formation and evolution in dwarf galaxies. She is also a long-time editor of AASWOMEN, CSWA’s weekly e-newsletter. Last week I wrote how my wife, Ellen, and I met in the graduate dorm at Caltech, got married, managed to complete our PhDs on the same month and land a pair of jobs. This year, the difficulties (and pleasures!) of simultaneous young kids and young careers. After advancing from postdocs to real jobs at UMd (Ellen) and Goddard (Neil), it was time to have kids. That sounds easy since people have been doing it since the beginning of time, but the difficulty was combining it with teaching, starting research, starting groups, publishing, traveling to conferences, tenure clock, …. Plus major rebuilding of a large dilapidated Victorian house we bought in College Park. Job one --- arranging child support. We were lucky in several ways. Two decent salaries and a large house allowed us to hire a live-in nanny to take care of the kids when they were infants. We had the same person live with us for 6 years and become part of the family. Second luck, Ellen's mother moved in with us after the nanny left and helped with the kids and cooking. She still lives with us now, 15 years later. Third luck, Goddard day care was excellent for pre-school through kindergarten. 6. Google Honors Maria Mitchell, First Professional Woman Astronomer in the U.S.